Dr. Monique Levesque-Hartle, D.C., D.A.C.B.N. 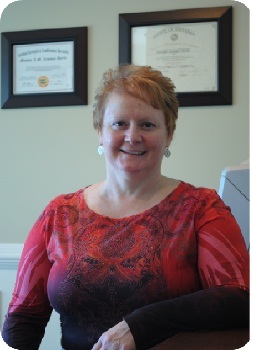 Dr. Monique Levesque-Hartle has been in practice since 1993. In addition to being a doctor of Chiropractic, she is also a Board Certified Clinical Nutritionist and Certified Strength and Conditioning Specialist. She is a graduate of the Master's Program for Whiplash Injuries as well. Dr. Hartle performs chiropractic adjustments to realign the spine as well as extremities such as shoulders, elbows, knees and ankles. One of the things that makes our practice very different from many other chiropractic clinics in that Dr. Hartle is one of a very elite group of doctors in the country that are certified to perform Active Release Technique(ART). This technique is a merging of neuromuscular reeducation and myofascial release which removes scar tissue, adhesions and muscle spasms from the body without surgery or drugs. She uses ART to treat muscle and soft tissue involvement in problems such as rotator cuff strains, carpal tunnel syndrome, ankle sprains, and knee tendonitis to name a few. She also uses ART to treat spinal problems such as whiplash, disc problems and lower back pain. Dr. Hartle uses cranio-sacral therapy which helps with a variety of different conditions such as ear infections and migraine headaches. In addition to this she provides nutritional and lifestyle counseling for her patients. We also do rehabilitation exercises with our patients to restore strength and flexibility. Our goal is to correct the underlying cause of the problems our patients present with. Do you have an interest in sports that led you to focus on that area? How does your own experience/involvement in sporting activities relate to the services you offer patients? I have been involved in sports since I was a child. I played softball, badminton, volleyball and curling in high school. I competed in powerlifting for 13 years. I am a 5 time Canadian National Champion and represented Canada at the World Powerlifting Championships for many years. I placed 5th at the Women's World Powerlifting Championships and also won a bronze medal at the World Bench Press Championships. I am fortunate to have been able to travel all over the world to represent Team Canada. I was ready for a change so I switched and joined the Fort Wayne Flash, a women's semi-professional tackle football team. I played left offensive guard for them. I have never had that much fun playing a team sport in all my life. I have also served as team doctor for both Team Canada and Team USA at many national and international powerlifting competitions. I also took up cycling in 2009 and rode my first century ride in Michigan in September of that year. It is a great sport I truly enjoy. My most recent challenges are mudathlons and adventure races. It is a great advantage in my profession to be an athlete as well. I have suffered many injuries myself, such as sprained ankles, fingers, rotator cuff strain, concussion, torn ACL, MCL and both meniscuses in my right knee for which I had to have surgery. This personal history allows me to understand the healing process from the athlete's perspective as well as the doctor's. I understand the frustrations with the length of time injury recovery takes and the dedication it takes with treatment and rehab that is necessary for a full recovery. What are the greatest challenges of your job? Other than the typical challenges of being a business owner, the greatest challenge I face is dealing with insurance companies and the changing economy. We work hard to provide the best quality chiropractic care and still make it affordable for families during these challenging times. The thing that is most rewarding to me is when you see the progress patients make. It always amazes me to see the changes in people, whether it's a man with severe lower back pain who can return to work to provide for his family, a grandparent who now feels well enough play with their grandchildren and get back to golfing, an athlete who recovers from an injury to set new personal records or get that college scholarship…the list goes on and on. It is extremely rewarding for me to be able to make a real difference in people's lives, to give them back their quality of life and return them to health. I have done my job when patients are able to resume their lives without a thought to their injuries. I love what I do and would choose the same career if I had to start all over again. Do any moments there stand out? There are too many to count. Some of my favorite ones are when young mothers are struggling with sleepless nights with children with ear infections or colic and they come in rested and beaming about the progress their baby has made. Another example is a headache patient that had been to the Diamond Headache Clinic, was on 7 different medications and was still having problems. We were able to get her off all her medications and she is still headache free to this day. She was able to return to work and spend time with her kids. We also treated a high school football player who sprained his MCL. He was told he would be out for 6 weeks. We had him back on the field in 3 weeks, just in time for the State Championship game! Dr. Shannon Nierman, D.C., L.Ac. Dr. Shannon was born in Fort Wayne and grew up in Kendallville where he attended East Noble High School. He attended IPFW before relocating to Houston, Texas. He has a Bachelor’s of Science degree in Human Biology and received his Doctor of Chiropractic degree from Texas Chiropractic College in December 2009. He is a veteran of the U.S. Navy who served on active duty from 1990-1995 and then transferred to the U.S. Army National Guard from 1997-2001. He was a deep sea diver in the US Navy. He then became a member of the guard unit in Angola and transferred to the Fort Wayne unit to be a recon/sniper team member. Dr. Shannon worked as an extern with the Rice University athletic department while finishing school. After leaving Texas he practiced in Jacksonville, Florida where he treated a Jacksonville Jaguar football player during the 2011 NFL season and he also treated one of the Indianapolis Clots players during the 2015 - 2016 season. Dr. Shannon is a 2 time Ironman finisher (He completed Louisville Oct. 11, 2015 and Wisconsin September 10, 2017), has completed the H.U.F.F., which is a 50K (30.1 miles), and has completed several other triathlons and runs. He continues to train for triathlons and distance runs and is currently training for several ultra marathons. He plans to run a 40 miler and a 62 miler this year with his sights set on a 100 miler next year. 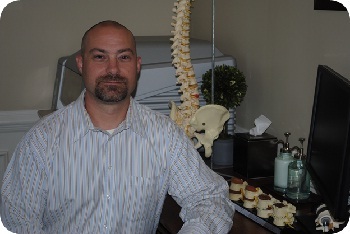 Dr. Shannon has taken 100 hours of class for the chiropractic neurology program. He is interested in sports and family care. He enjoys building long lasting relationships with his patients and the community. Dr. Shannon offers acupuncture treatment in addition to the other services we offer here. Acupuncture is good for things like...Weight Loss, Face Lifts, Infertility, Stop Smoking, High Blood Pressure, Allergies, Headaches, Stress, Pain, Fatigue, Sinus Problems, General Wellness...Among many other things.